The High Priestess of Vesta, guard of the sacred fire, is relaying the Olympic Flame at the ruins of the historic Temple Of Hera in Ancient Olympia, Greece. Hi, I attended an international symposium today about the question, what happens next with Europe. As you know, the financial crisis in Europe is already lasting five years and Greece was also a big topic, of course, as it is standing at the edge of a political, financial and economic abyss. The really sad part is, that in most cases it is the normal people who are suffering the most from the crisis, because of the corruption, greed and incapability of the establishment, but this is another topic. Today, we are looking back, to something more beautiful to cheer you up, to an old Roman tradition, which lasted more than a thousand years (700 BC till 380 AD), the history of the Vestal Virgins, who were in Ancient Roman religion the priestesses of Vesta, the goddess of the hearth (fire place) and home. The Vestals were selected at a very young age and were spared of the burden of getting married and having children in favor of pureness. In fact, they had to take a vow of chastity for a thirty year long service as a Vestal in honor of goddess Vesta and played an important role in Roman society. After their service, they were free to marry and love. They also enjoyed several privileges and were allowed, unlike most Roman women of that time, to own property, make a will and vote, as well as to free condemned prisoners and slaves by merely touching them. One of their main tasks was to keep the sacred fire lit and they also participated in numerous rituals and public ceremonies. A cardinal offence of the Vestals was letting the sacred fire extinguish, which was interpreted as a sign of disfavor towards the goddess, resulting in loosing the divine protection over the city. Even worse, was breaking the oath of chastity. Vestals convicted of such offenses were severly punished. Their secret lovers, whipped to death. 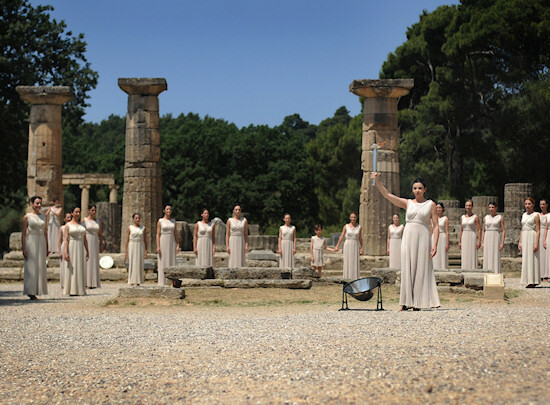 Fire was also a divine symbol of the Ancient Olympic games, but it was the Germans who introduced the modern torch relay ceremony for the 1936 Berlin Olympics, where the Olympic Flame was lit at the historic place in Greece by women representing the Vestal Virgins Of Rome. The flame was then relayed to Berlin by over three thousand torchbearers. 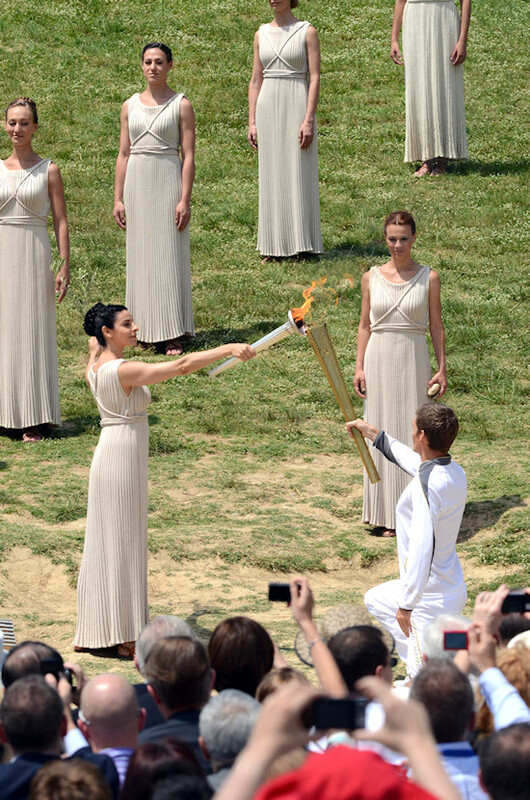 The lighting ceremony is nowadays performed for both Winter and Summer Games and took place last week in Greece for this year's Summer Games in London. 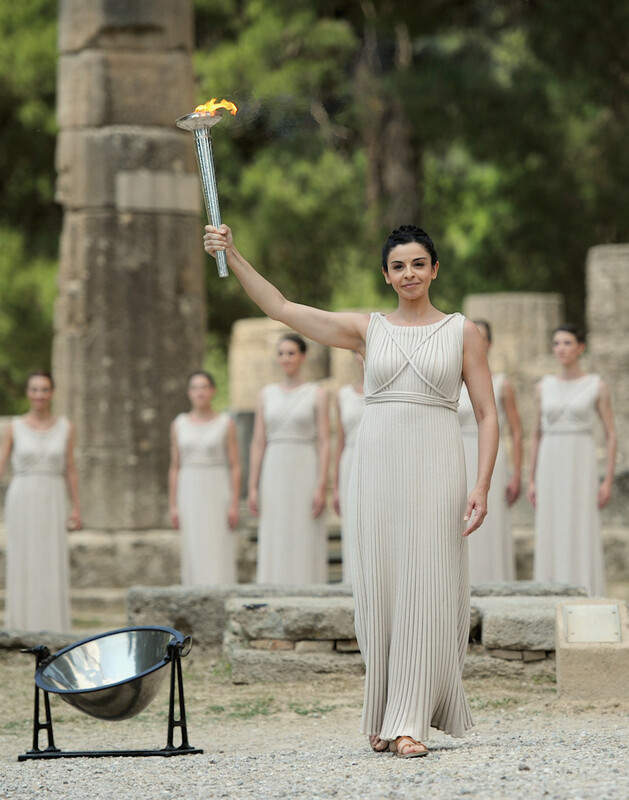 The Olympic flame is lit by the High Priestess, played by Ino Menegaki, using a parabolic mirror and by the power of the sun. 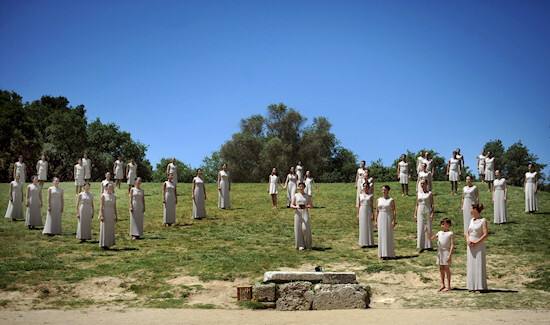 The lighting ceremony was choreographed by Artemis Ignatiou. The first torchbearer was British-born Greek 10km swimming world champion Spyros Gianniotis. All photos courtesy of the London Organising Committee of the Olympic and Paralympic Games (LOCOG). Could you imagine being chosen as a Vestal Virgin? They look pretty well worn and ropey for vestal virgins.